Reliable delivery of emails is crucial for business. Proper Magento 1 SMTP extension settings greatly increase the chance for your order confirmations, marketing emails and other correspondence to get actually delivered to customers. By default Magento uses PHP ‘sendmail’ for sending emails. In vast majority of cases emails are dispatched via the mail server of the server where Magento is installed. This may have a serious impact on how your messages are treated by your recipients’ mail servers. In other words, it’s quite likely that your emails will either end up in spam folders or will get rejected altogether. The extension enables you to use any third-party SMTP server for your Magento store and configure all the necessary Magento email settings to resolve this problem. 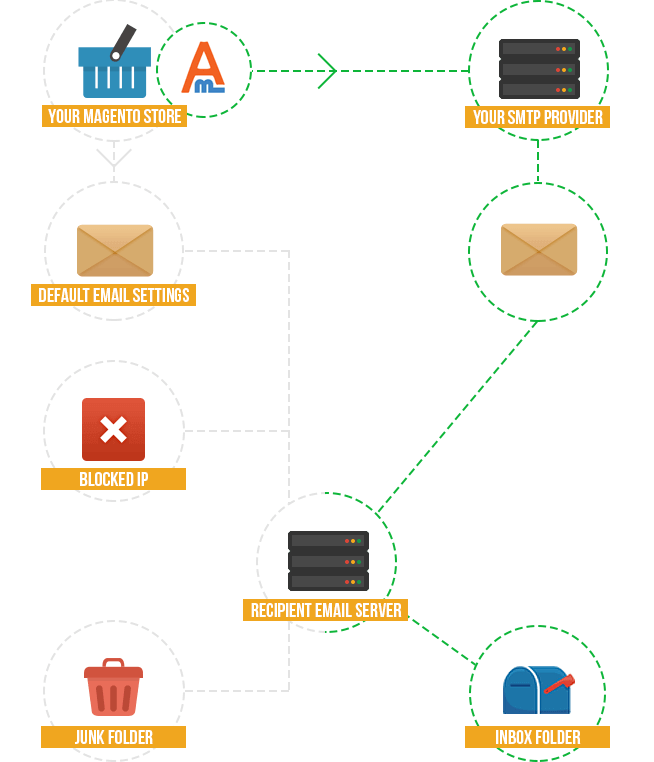 You can use reliable SMTP servers like gmail or yahoo to give your emails the highest chance of getting through to your customers. As mentioned above, with SMTP Email Settings Magento extension, you can use any third-party SMTP server you prefer. Thanks to pre-defined data autofill option you just need to select a certain SMTP provider, and other fields such as 'Server Address', "Port" will be filled in automatically. Sender Policy Framework (SPF) is an email validation system designed to prevent email spam by detecting email spoofing by verifying sender IP addresses. We provide instructions on how to setup SPF record in the extension user guide. You can check if the Magento email SMTP connection you’ve setup works correctly. If there’s any error, you will see it in the debug log. Magento 1 SMTP Email Settings extension lets you log all the emails sent from your store. You can view the list of all emails sent and also open any of them to see what exactly was sent to a customer. The log is shown in admin panel, no need to go to the file system. If needed, you can have the log automatically cleared, e.g. remove the messages sent 90 or more days ago. You can have the module emulate sending of emails without actually sending them. You will also see the log to make sure the Magento SMTP settings work correctly. Like the above one, this log can also be cleared automatically. Does this SMTP extension allow multistore setup? Yes, sure. Our module is fully compatible with multistore configuration. What types of authentication/encryption are supported? Our Magento SMTP extension supports authentication with standard cryptographic protocols: SSL and TLS. TLS is constantly improving. Please click here for more information. What email servers are supported by this SMTP extension? Our SMTP module can be configured to send emails via Yahoo, Gmail or any other third-party SMTP server. Note that reputable SMTP providers may increase your chances of reaching your customers. Click here to see why. Due to a pre-defined data autofill option you will just need to choose a certain SMTP provider, and other fields ('Server Address', "Port", "Connection Security", etc.) will be filled in automatically. Is there a way to log and view the emails sent to guest customers? With this extension you can see detailed email logs of all the letters sent right in your Magento admin panel. Test email is being sent fine while order confirmation email is not. How can I troubleshoot? Here are the most frequently reported causes: 1) Order confirmation emails, invoices, etc are not being sent out. 2) Logs are not recorded. If you have one of the above-mentioned symptoms, please click READ the Full answer link below. I'm getting connection refused or connection timed out error in debug log. What should I check? If you're connecting from behind the firewall, make sure the firewall rules allow you to connect the specified mail server. What should I do if emails are not being sent out via Amasty SMTP extension? Having troubles with sending emails? Try disabling the extension in main module configuration page and check if you're getting the same result with Magento default PHP sendmail. Please proceed to READ the Full answer link to get further instructions. I run multiple stores some are still on m1. Others that I started later are on m2 with them there’s no problem. But with magento 1 is often much hussle. Like I needed to change email sender while placing order from admin and the module didn’t accept changes so I had to send as it was, with another address. Short after I reported this problem and the dev team fixed it. Can work with no troubles again. Very fast response. Please addd a feature of periodic automated testing of the settings. But I like the extension. Thanks dear friends. Really nice that it keeps a log of all emails that has been sent. This extension really help us deduct the issue we were facing in sending email from server using the logs and rectified it. Also the developer support wonderful, they did some custom development for us usage. I had some troubles with this module mostly because of my system. Team helped to install, explained how to work. Still I missed some customers as dispatch wasn’t easy and I had to send them one by one. Now they added new feature and I can send many emails auto with cron. Of course first you need to set this cron job. I called team for help and they did refuse to do it. No more wasting time on hard boring tasks. I needed a module to avoid spam folder, first bought from another vendor as it was much cheaper. It was easy to install but their support didn’t work well just ignores you. So I decided to switch to amasty. Yes, it’s more expensive but their support is always available they helped me set up and now I face no problems. More than that it has a spam-checker, which’s exactly what I looked for. At first we didn’t know we need this modul. We asked Amasty about moduls to buy because our email didn’t go to customers. Amasty said we ne ed to buy this. After we had problems with settings, because it’s very difficult to understand. Amasty helped us with settings. Now our emails go to customers. Thank you for helping us. To my surprise I managed to install and configure the mod in about 20 minutes. But once the tool was installed I faced the problems with my server smpt connection. This is not the plugin’s fault by the way. Customer care team did their best to fine tune the mod the way I needed. After all, email sending is not the issue anymore. Well done, guys. I do appreciate when the tool meets my expectations. The installation was flawless, but the plugin didn’t start working right out of the box. With the help of the detailed manual and support guys I finally managed to run it the way I needed. It was not about the module it was about me as I’m used to getting help from outside rather than to try set everything myself. Now the plugin works like a charm, no conflicts, no errors and the configuration that confused me at first appeared to be intuitive and clear. I’d recommend this tool to any store dealing with mass email sending. Holidays are coming, so we are about to launch numerous email campaigns and I hope this plugin will do its best for us. Nice, but some improvements are welcome! It would be great if extension have predefined server setting templates for common providers. Otherwise, it's great.